Ok you guys must’ve caught on by now. Wednesdays are when I completely ignore that this is supposed to be a finance blog and share some blogging tips. Since a lot of us are making money with our blogs, I guess it ties in a bit. Mostly though I just want to give back to the extremely supportive finance blogging community. This is the 3rd part to my blog keyword research series. In the first part I covered the basics of using the Google AdWords keyword tool to find keywords. In the 2nd part I gave some tips on how to effectively use keywords on your blog. 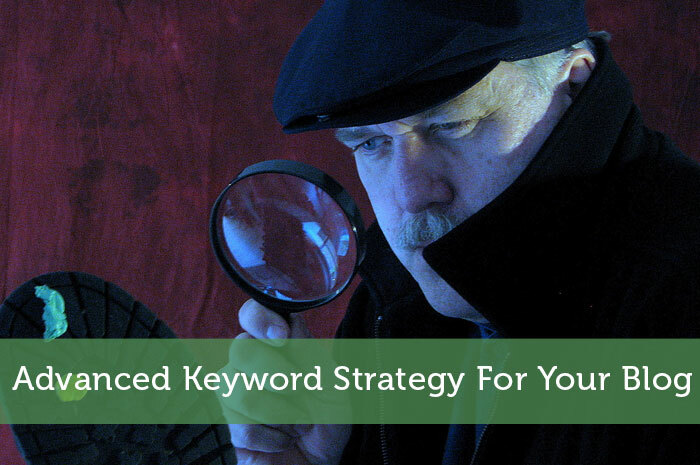 In this 3rd installment, I’ll provide some more advanced strategies of how you can use keywords to your advantage on your blog. There is more to keywords than just choosing good target keywords and using them in your posts. If you want to get the most out of keywords you really need to be taking things to the next level. There are countless webpages that could be relevant for your target keyword phrase. So how do you go about showing search engines that you page should be considered most relevant? Rather than drawing things out, I’ll jump right into the most important part. For a long time, SEO has largely been a popularity contest. The websites with the best links and/or the most links are assumed to be the best resources. First there is the overall backlink strength of your entire domain. All of the links you get to all of your blog’s pages snowballs to form your domain’s overall link profile. A strong domain link profile can get a lot of your other pages ranked well just from your internal links. For more competitive keywords it usually takes more than just internal links. This is where it is important to get external links pointing to all of your important pages. If your page keyword optimization is solid, any kind of links well help it rank better. To rank well though you’ll want to get links that have your target keyword in the link anchor text. If those links happen to come from pages that are relevant for your target keyword, the links are worth even more. As mentioned above, internal links can be quite useful for getting some links to your important pages. For some keywords it is all that is necessary to rank well. For your especially important pages, it is a good idea to link to them from within your sidebar, header or footer. That way those pages have links from all of your pages. The problem with this is that it is believed that Google discounts links that appear to be part of the main navigation. So to take it a step further, link to those pages from within the content of your posts. When links are surrounded by text it is called an ‘in-content link’. These links are believed to carry more weight. For interlinking within post content there are WordPress plugins to help automate this. This ensures that internal links are added without having to remember each time you write a post. I prefer to include internal links manually so that I can use a more natural variety of link anchor text. Either way, it makes a lot of sense to take advantage of internal linking since it is the easiest links you can get. For some topics you will be pretty limited in which keywords make sense to target. For other topics there might be a wide range of keywords that you could target. Obviously you can’t use all of those keywords in the important locations of your post. In some cases you can still effectively target several different keywords with one page. The key is that the phrases are similar enough that they have overlapping words or have different forms of one of the words. For example, with this post I mixed in the phrase ‘keyword strategy‘ and ‘keyword strategies‘. And yes I made those bold font just to reinforce to search engines that those are the important keywords for this page. The trick is that you use the other variations of your target keyword phrase in some important places in your post. Just don’t get carried away trying to fit in a whole bunch of different keyword phrases. If lots of long tail keyword phrases do show up in the Google AdWords keyword tool, you could still mix those into the main content. Don’t sacrifice post quality when doing this. If your page builds up enough backlink strength, it becomes much easier to rank well for those secondary keyword phrases. It is sometimes as simple as getting some extra backlinks that use those secondary keywords as link anchor text. This is where it is very helpful to target long tail keywords as your main target keywords. Then there are naturally shorter secondary keywords that you have already optimized for. When you are initially choosing a target keyword phrase for your important pages, it is a good idea to check what approach your competitors are taking. Try doing a Google search for the keyword you are considering targeting. If you know what to look for you can usually tell right away whether it might be very competitive. From the 1st page results, look at how many use that phrase in their title, excerpt, url and sometimes even domain name. If someone has built an entire domain around a specific keyword phrase there is a good chance it is a competitive keyword. If they’ve done much marketing, their homepage should have more links than most individual pages they are competing against. If lots of pages are using that exact phrase in their page titles, again it is a sign that it is fairly competitive. Ideally the 1st page results are mostly targeting other variations of the keyword you want to target. You might also want to take into consideration the overall domain strength of the sites that are ranked well. Sometimes you will just recognize the site name and know it must be quite strong. In other cases you can visit the site to see what their PageRank is. Obviously you’d be better off competing against some PR3 sites instead of PR5-6 sites. I was going to announce the winners for my 6 month blog anniversary contest today. With the amount of social shares, I’m going to wait until Friday instead. That way I can give another thanks to the co-sponsors. Also they have a bit more time to get the prizes to the winners. If you haven’t been contacted yet, sorry to say, you probably didn’t win. Thanks for everyone that entered though. Does anyone else have any keyword strategies that you employ? Are any of you using a plugin that automates internal linking? Did I share anything that wasn’t already obvious? Thanks for the tips! They are always appreciated!!! Well I’ll keep them coming then. I’m sure there’s still a lot more blogging tips that I’ve picked up that I can pass on. I don’t know about that. You 2 are off to an awesome start with your blog. I think people can learn a lot from your strategies. Thanks again for the tips. Very helpful! No problem John. I’m starting to wonder whether you have a blog or not since you never link to it in your comments. Good catch Jeremy! 🙂 It’s coming actually. I am about ready to lauch my own blog here VERY soon. I’ve been reading as much as I can and designing my blog. It all seems just a bit overwhelming, but thanks to helpful information like you’re providing, I am excited to see what will come of it. Honestly the most overwhelming part is all the commenting on other blogs. So it’s great that you’re getting into that already. And no problem about providing some helpful info. I’m all about good karma and I know the more people I help, the more good things will come my way. Thanks Mr CBB. I can’t say I’ve ever read any books on blogging or SEO. There is just so much great free info out there. So I’m glad to be able to help contribute to it. Of course there are benefits for me too. If you do want to monetize a blog, SEO becomes a whole lot more important. Actually even if you want to reach a lot of people with your message it’s very important. Congrats Anne. That is confirmation that you’ve been doing a good job with link building. The trick with PR is to never be satisfied with your current level. Keep pushing to get more and more links. It might not get you to PR4 in the next update, but it will keep giving Google the signs they need to rank your pages well. Thanks Sean. Most of these tips do also apply to any kind of website, not just blogs. Some solid Tips again J! ‘To rank well though you’ll want to get links that have your target keyword in the link anchor text’ – Very good point. I must consider this when submitting to carnivals etc.! Well fortunately you will have your main target keyword in your post titles. With blog carnivals you are limited in what you can use as the link text. It’s things like internal links where you have much more control of the link text. I always forget that each page of your site carries its own score, and that your overall domain can help farm some of that score out to your individual post pages. I like your suggestion to interlink while making sure to include your keyword in the anchor text. I suppose that if the keyword is already part of your post title, then simply referencing it within the body of your text would accomplish this. So for external links to be effective, it would also help if they include the keyword in the anchor text as well, correct? Suppose if someone said visit “My Money Design [Post Name]” that would be better than saying “for more information, click here”? Do secondary keywords still help even if they don’t appear in your title? Would a sidebar or footer example be something like a “Top Posts” widget? Yes just linking with your post title usually gets some good keywords in the link text…provided that you originally optimized the post. All links to a page have the potential to help, but there are various ways that the link can pass extra relevance for specific keywords. If your links don’t have good keywords in them you would likely just need a lot more of them for the onpage optimization to be enough. Secondary keywords still can help if they’re not in your title, but it helps significantly if some of the individual words are. Since links count for so much, you can build relevance for a page just with links using those secondary keywords. And yes the top posts widget would be an example of links that might be discounted a bit. With the way that list can change periodically it might not be assumed to be part of the main navigation. I’m not really sure. Since reading your post on Keywords I’ve gotten a lot better at strategizing it. Our views from google have gone way up. I also manually do my internal linking for the same reasons as you. I want it to link to relevant topics. Great series! Glad to hear that you’re making some progress with SEO. Now that you’re getting the onpage stuff optimized, focus a lot on getting lots of quality links each week. That will make a huge difference, but it takes some time for those links to build up and receive full credit. Great tips, Jeremy! I’ve been completely ignoring my blog lately (as I’m sure you can tell) but I still love reading your blogging topics. Back when I was really trying to optimize my blog, I found that keywords were huge in driving more traffic to it. Even now when I’m not posting, my older posts that I included keywords for still get more traffic than I expected. Nice to see you’re still checking out my blog while taking a break from blogging Kyle. It makes a lot of sense that your keyword optimized posts would get a lot more traffic than other pages. To Google it just doesn’t think those unoptimized pages are particularly relevant for any keywords with decent search volume. I’ll share my trick with you guys: Go to Yahoo!Answers and look to see what people are asking about money / finance etc (whatever is relevant to your blog or the subjects you talk about.) Use the most common questions in your titles and address the issues being questioned. Next thing you know the traffic that would otherwise go to Yahoo!Answers will be coming to your blog! Good tip Veronica. Ironically the blogging tips post next week talks about that specific kind of thing. If the question is common enough there would usually be enough search volume for those keywords. Still you’d want to double check your keyword choice in a keyword tool. Plus your blog will need some link strength to outrank the yahoo answers posts. Indeed, which I will be covering soon in my SEO Thursdays posts. I’m sure it will be a good series since you seem to be fairly knowledgeable about the subject. I may be missing something here, but what is anchor text (I know, I should probably just google it, but figured I’d ask while I’m here)? Is it the post description text? Also, I am so behind on writing that I don’t make ANY time to research as of late. I have been writing my posts the night before and getting to bed late, which is not a great place to be. Once our house projects are completed, I need to take a Saturday and knock out 5 or so posts and do some research with them as well! Great tips, once again. Thanks Jeremy! Anchor text is just a word or a phrase you attach a link to. For example, if I linked to Jeremy @ Modest Money (and attached a link to Jeremy’s blog via his blog title), “Modest Money” would be my anchor text. Anchor text is used as means to identify what your page is about, but is not the only signal to let google know what your blog covers. General keyword usage, titles, and strength of backlinks are among many. Thanks for helping answer that question Veronica. You are definitely right. I find that link anchor text is the most powerful way to reinforce a page’s relevance. With anchor text alone you can rank a page for a keyword that it has no business ranking well for. I can relate to writing posts the night before. Too often I’ve been doing that, but it’s not too bad since I do accept plenty of guest posts in between. Based on a forum suggestion, I use a plugin called Automatic SEO Links. I tell it what a URL that I would like to link to every time I use a certain word. So without any conscious thought, every time I reference my George Foreman grill it will link to my #1 ranked post on different uses for the George Foreman. Interesting, I have to check this out. Thanks for the tip! I was going to try to find the name of the popular plugin that does this, but I think there are several that essentially do the same thing. You just have to be careful that you are not using it for keywords that get used too frequently. I saw a blog that had somehow set it up for the word ‘the’. Yeah it was quite a mess. I can imagine what a disaster that would be. I bring up my George Foreman fairly regularly, but it probably boils down to once every dozen posts. I’m still on baby steps, but someday will start at the beginning and reread. Always appreciated! Early on read as much as you can about SEO. Then you can get your blog all optimized early on and just get in the habit of doing things in a search engine friendly manner. For example, you really should have a title for your homepage. Great tips about keyword search..especially about the anchor text link. And thank you very much for the mention: I appreciate it! No problem Ornella. Definitely do what you can to use good link anchor text. It is essentially a vote for those specific keywords used. So wait, I didn’t win? Okay, well, then I’ll say this. I have an SEO plugin that you put keywords into when you write and save a post. But other than that, I’ve spent zero time thinking about keywords or using good ones, etc. But I get it, I get it, it would really help. Maybe this weekend I’ll spend a little time on it! Actually you won, but I figured you were such a good guy that you’d rather someone else win. So I drew another name 😉 I kid lol. Do pay more attention to keywords, but more importantly, pay attention to building lots of quality links each week. Thanks for the tips! I only skimmed them but I’ll be back here later to make sure I’m doing it right! I still feel like such a NOOB at SEO. I’ve been doing SEO for about 10 years. So I would hope I have a bit more knowledge with this stuff than a lot of bloggers. Many bloggers just get by with the quality of their writing and their networking, but the lack of focus on SEO holds them back. As a relatively new blogger, I’m really enjoying these posts. Thanks for putting them together. No problem DC. These posts are specifically meant for the newish bloggers. Well even some more experienced bloggers might find some of this stuff helpful. All great tips that I will need to start to utilize on my site. I did know some of this stuff (I’m not completely clueless to all of this! ), but found some useful bits throughout. Thanks for sharing…looking forward to next weeks tips! Really though there’s always more advice that can be given. It looks like we’ll have a guest contribution for this series next week, but I’ll have to think up a good topic for the following week. SEO definitely doesn’t produce quick results. Making on-page improvements help a bit, but ultimately you have to put in a lot of work improving your backlink profile. It is those links that is the meat and potatoes of SEO. Backlink building is an interesting SEO topic. If you can get a link from a PR5 or 6 site with your keyword embedded then your page can likely rank higher. In many ways both on page and off page SEO processes are like how humans interact as a collective society. Higher your reputation, more respect you get. 🙂 Thanks for the great article, Jeremy. Yup it’s very much like that. If enough quality sites associate with yours, it is just assumed that your site is worthy of respect. A link from a PR5-6 site is good, but you have to think in terms of higher volume. It would be much better if you got a group of the ‘cool kids’ to all link to you. Then it really confirms your popularity. Your blogging tips are always appreciated. All the SEO and Keyword strategies are things where I just need to take an entire Saturday and go over everything. It’s hard to find time during the week as I’m writing to do all the little things like that. I think I will try out some of the plugins that have been mentioned. Maybe that will help going through the process more efficient. Yes for people who are strapped for time the automated internal linking plugins would be quite useful. The other benefit of internal linking is that it retains some benefits when someone scrapes your content. REally informative stuff. To me, this info is like learning a new language, just gotta be patient and implement the strategies one step at a time, thanks for the great info! No problem Barb. It is a pretty easy language to learn once you get the basics down. I’m sure you’ll pick it up in no time. You’re right that you shouldn’t overwhelm yourself and try to implement everything all at once. Take the time to really get in the habit of using each strategy. Hahaha I’m with Barb, it’s like reading klingon to me! I’m going to have to go back and read your other posts on this. Yes this was the more advanced post from this keyword optimization series. So some of it may not be crystal clear for some people. You’re welcome to ask me questions about anything you’re not sure about. So you’re saying that our meta descriptions should contain the keyword or phrase that we’re hoping to rank for? Along of course with our title, keywords, content. What about categories and tags too? Do they even matter? Yep I’d put your main target keyword in all of those locations. I like to also put it in the tags too so that you create a very relevant internal link to that post. For example with this post I get internal links from the tag pages for keywords such as blog strategy & blog strategies. I have Market Samurai that I really need to start using for keyword research. These days, I just write about what I like. I’ve used Market Samurai a bit in the past, but in the end I just went back to the Google AdWords Keyword Tool. It is fine to write about what you like, but by using a keyword tool, you can focus that post on the best keyword related to that post. It can be the difference between getting a bunch of search engine traffic to that post and getting none at all. My favorite is when we catch the long tailed keywords that show up in multiple searches.. We have on in particular that we get a ton of traffic from about 100 different versions of the same search. Sounds like you found a great long tail keyword phrase. The more popular your topic is, the more likely that there will be lots of variations. If those phrases all overlap you’re set. I started using internal keyword linking about a month ago, and I have noticed the difference in the number of site visits that I get. I’m also linking to my book page on Amazon within the text and that seems to get a lot more clicks than just having the link in the sidebar. Good point about how those internal links also get more clicks than sidebar links. People reading in an rss reader wouldn’t see that sidebar and lots of other people just subconsciously ignore it. I have optimized my blog posts for some tough keywords such as ‘google adsense approval ‘. I was at the first page in google for four months, and now I am in second page. I thought day by day the rank will increase. Why this happened ? How to regain my place again m?